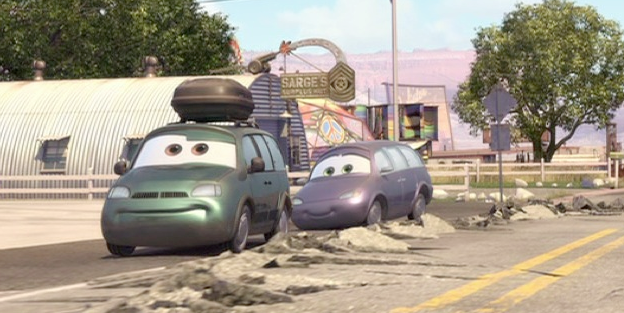 Van and Mini's appearance in Cars wasn't long, but it was sure hilarious and memorable. These characters were so well liked that they even showed up after the credits of the original film (if you haven't seen that, pop in your DVD now and fast forward to the end of all the credits) and even briefly at the end of Cars 2. This is a 1:55 scale diecast car from Mattel. This particular version has "lenticular" movie eyes, but he was also released with fixed eyes in the "World of Cars" series as well. I'm still missing the Mini (or sometimes called Mrs. Van) as this one is pretty rare and hard to come by (it's $40 on Amazon!). If anyone knows where I can get one for a decent price, be sure to let me know. Also, if you didn't know, there was another version of Van released in the "Chase" Lenticular eyes series, Van with "Nice Butte" sticker! I just found this out, so I thought I'd pass that on. I'll have to get that one asap.